Objective To determine the economic impact of medication non-adherence across multiple disease groups. Evidence review A comprehensive literature search was conducted in PubMed and Scopus in September 2017. Studies quantifying the cost of medication non-adherence in relation to economic impact were included. Relevant information was extracted and quality assessed using the Drummond checklist. Results Seventy-nine individual studies assessing the cost of medication non-adherence across 14 disease groups were included. Wide-scoping cost variations were reported, with lower levels of adherence generally associated with higher total costs. The annual adjusted disease-specific economic cost of non-adherence per person ranged from $949 to $44 190 (in 2015 US$). Costs attributed to ‘all causes’ non-adherence ranged from $5271 to $52 341. Medication possession ratio was the metric most used to calculate patient adherence, with varying cut-off points defining non-adherence. The main indicators used to measure the cost of non-adherence were total cost or total healthcare cost (83% of studies), pharmacy costs (70%), inpatient costs (46%), outpatient costs (50%), emergency department visit costs (27%), medical costs (29%) and hospitalisation costs (18%). Drummond quality assessment yielded 10 studies of high quality with all studies performing partial economic evaluations to varying extents. Conclusion Medication non-adherence places a significant cost burden on healthcare systems. Current research assessing the economic impact of medication non-adherence is limited and of varying quality, failing to provide adaptable data to influence health policy. The correlation between increased non-adherence and higher disease prevalence should be used to inform policymakers to help circumvent avoidable costs to the healthcare system. Differences in methods make the comparison among studies challenging and an accurate estimation of true magnitude of the cost impossible. Standardisation of the metric measures used to estimate medication non-adherence and development of a streamlined approach to quantify costs is required. This is a novel attempt to use existing studies to broaden the scope of knowledge associated with the economic impact of medication non-adherence via quantifying the cost of medication non-adherence across different disease groups. A large comprehensive review—2768 citations identified, 79 studies included. Inability to perform a meaningful meta-analysis—insufficient statistical data and considerable heterogeneity according to outcome/indicators. Robust application of adapted Drummond checklist to evaluate the quality of economic evaluations. The objective of this systematic review was, first, to determine the economic impact of medication non-adherence across multiple disease groups, and second, to review and critically appraise the literature to identify the main methodological issues that may explain the differences among reports in the cost calculation and classification of non-adherence. A literature search was conducted in September 2017. Studies reporting the cost of medication non-adherence for any disease state were included. 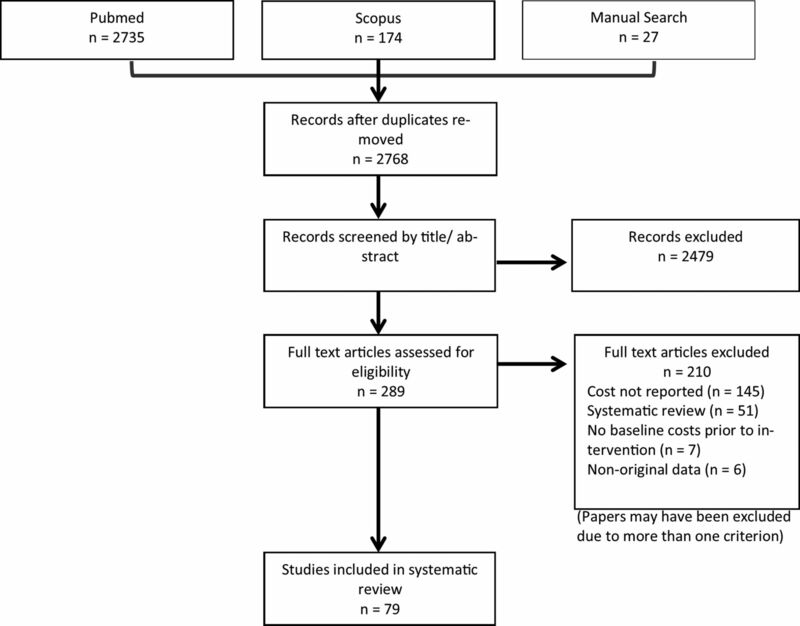 Searches were conducted in PubMed and Scopus. Neither publication date nor language restriction filters were used. The search used in PubMed was: (non-adherence[TIAB]) OR (‘Patient Compliance’[MH] AND (‘Drug Therapy’[MH]) OR medication[TIAB])) OR ‘Medication adherence’[MH] AND (costs[TIAB] OR ‘Costs and Cost Analysis’[MH] OR burden[TIAB]). This was adapted for other databases in online supplementary etable 1. Duplicate records were removed. To identify relevant articles, an initial title and abstract screening was conducted by the lead reviewer (RLC) to identify studies appropriate to the study question. This process was overinclusive. In the second phase appraisal, potentially relevant full-text papers were read and excluded based on the following criteria: (i) papers not reporting the cost of medication non-adherence as a monetary value, (ii) systematic reviews, (iii) papers not reporting a baseline cost of medication non-adherence prior to the provision of an intervention and (iv) papers not reporting original data. Any uncertainty was discussed among two adherence experts (RLC and VGC) and resolved via consensus. A data extraction form was developed based on the Cochrane Handbook for Systematic Reviews 18 and piloted on a sample of included studies. The extracted information included the source (study identification, citation and title), eligibility (confirmation of inclusion criteria), objective, methods (study design, study groups, year data extracted, follow-up period, comparison, adherence measure, adherence data source and adherence definition), population (sample size, setting, country, disease state/drug studied, inclusion/exclusion criteria and perspective), impact/outcome indicators (indicators measured, indicator data source, indicator definitions and characteristics of the method of assessment), results (costs reported, standardised costs, type of costs, non-cost findings, subgroup analysis and statistical significance), conclusions and miscellaneous (funding source, references to other relevant studies, limitations and reviewers’ comments). Costs were defined as any indicator associated with medication non-adherence that was quantified with a monetary value in the original study. This included direct costs (those costs borne by the healthcare system, community and patients’ families in addressing the illness), indirect costs (mainly productivity losses to society caused by the health problem or disease) and avoidable costs (those costs incurred for patients suffering complications, resulting from suboptimal medicines use, and patients with the same disease who experienced no complications). The indicators were grouped for analysis based on the original studies’ classification of the cost. All costs were converted to US$ (2015 values) using the Cochrane Economics Methods Group—Evidence for Policy and Practice Information and Coordinating—Centre Cost Converter tool,19 allowing meaningful comparisons between non-adherence cost data. This online tool uses a two-stage computation process to adjust estimates of costs for currency and/or price year using a Gross Domestic Product deflator index and Purchasing Power Parities (PPP) for Gross Domestic Product.19 The PPP values given by the International Monetary Fund were chosen. If details of the original price year could not be ascertained from a study, the midpoint year of the study period was used for calculations. The mean cost was calculated and reported where studies separated out costs for different confounding factors within the one outcome measure in a disease state. Annual costs were extrapolated from the original study data if results were not presented in this manner. The definition of medication non-adherence was derived from the included studies; with non-adherence referring to differing degrees of adherence based on the studies metric of estimation. Multiple non-adherence costs from individual studies may have been included where further subclassification of non-adherence levels was defined. The analysis assessed non-adherence costs within disease groups, with disease group and cost classification derived from the study. Total healthcare costs included direct costs to the healthcare system while total costs incorporated direct and indirect costs. Economic evaluation requires a comparison of two or more alternative courses of action, while considering both the inputs and outputs associated with each.20 All studies were classified in accordance with Drummond’s distinguishing characteristics of healthcare evaluations as either partial evaluations (outcome description, cost description, cost–outcome description, efficacy or effectiveness evaluation, cost analysis) or full economic evaluations (cost– benefit analysis, cost–utility analysis, cost-effectiveness analysis, cost minimisation analysis) by team consensus (RLC and VGC). The Drummond checklist21 for economic evaluation was used to assess the quality of studies. The original checklist was modified to remove inapplicable items (4, 5, 12, 14, 15, 30 and 31) as no full economic evaluation met all inclusion criteria. A score of 1 was assigned if the study included the required item and 0 if it did not with a maximum potential score of 28. The study was classified as high quality if at least 75% of Drummond’s criteria were satisfied, medium quality if 51%–74% were satisfied and low quality if 50% of the criteria or less were satisfied. Outcome/indicator costs were independently extracted using predesigned data extraction forms (total healthcare costs, total costs, inpatient costs, outpatient costs, pharmacy costs, medical costs, emergency department costs and hospitalisation costs) for the purpose of integrating the findings on the cost of medication non-adherence to pool data and increase the power of analysis. Search strategies retrieved 2768 potential articles after duplicates were removed. Two hundred and eighty nine articles were selected for full-text review. Seventy-nine studies were included in the review (figure 1). Numerous other papers do discuss non-adherence costs; however, they addressed tangential issues or did not present primary relevant data. Many studies failed to report the monetary value of medication non-adherence associated with a range of cost estimate indicators. Preferred Reporting Items for Systematic Reviews and Meta-Analyses (PRISMA) flow diagram. The PRISMA diagram details the search and selection process applied during the overview. The search yielded a total of 2768 citations. Studies were selected based on the inclusion criteria; studies reporting the cost of medication non-adherence using original cost data. Intervention studies were required to report baseline data. Seventy-nine original studies met the inclusion criteria. Sixty-six studies (83%) were conducted in the USA,10 22–85 four in Europe,86–89 four in Asia,90–93 three in Canada,94–96 one in the UK97 and one across multiple countries throughout Europe and the UK.98 Publication years ranged from 1997 to 2017; in accordance with the Cochrane Handbook for Systematic Reviews, no date restriction filters were used18 with earlier studies following the same pattern of association between medication non-adherence and increasing healthcare costs. Individual studies reported a large variety of costs, calculated by varying means. In total, 44 studies (56%) reported unadjusted costs,22 26 27 30 32–36 38–42 45 47–49 51–55 57 62–67 71 74 80–82 85 87–89 91–93 98 21 (26%) adjusted costs,10 23–25 29 31 43 50 56 58–60 70 72 75–77 83 84 86 90 11 a combination of adjusted and unadjusted,28 37 44 46 61 68 69 73 78 79 96 2 unadjusted and predicted94 95 and 1 predicted costs.97 The method of determining non-adherence ranged significantly between studies with majority of papers using pharmacy and/or healthcare claims data (97%).10 22–29 31–51 54 56 58–87 91–96 Some studies used a combination of surveys or questionnaires, observational assessment, previous study data and disease state-specific recommended guidelines. Medication possession ratio (MPR) was the most used method to calculate patient non-adherence with 51 studies (63%) reporting non-adherence based on this measure13 24 25 28 29 32–36 40–43 45 46 48–50 54 56 57 59–63 66–77 80 81 85–87 91–96; however, the cut-off points to define medication non-adherence differed with some studies classifying non-adherence as <80% medication possession and others through subclassification of percentage ranges (eg, 0%–20%, 20%–40%, 40%–60%, 60%–80%, 80%–100%). The proportion of days covered (PDC) was the next most common measure of non-adherence (11%),31 37 44 47 51 78 79 82–84 with all other studies using an array of measures including self-report,97 urine testing,55 observational assessment,98 time to discontinuation,58 cumulative possession ratio,23 disease-specific medication management guidelines,65 88 Morisky four-Item scale,52 medication gaps,38 prescription refill rates22 27 and medication supplies.10 The main characteristics of the included studies are summarised in online supplementary etable 2. The quality assessment of economic evaluations yielded 10 studies of high,13 33 37 49 50 56 70 74 86 92 59 of medium10 22–26 28–32 34–36 38–47 52–55 57 58 60–63 65 66 68 69 71 72 75–81 83–85 87 88 90 93–98 and 10 of low quality.27 48 59 64 67 73 82 89 91 Scores ranged from 26.1% to 87.5% (mean 62.63%). Only one study identified the form of economic evaluation used and justified it in relation to the questions that were being addressed.70 The item ‘the choice of discount rate is stated and justified’ was applicable only to studies covering a time period of >1 year; all studies that cover >1 year failed to identify or explain why costs had not been discounted. Details of the analysis and interpretation of results were lacking in the majority of studies resulting in medium-quality or low-quality scores. Through use of Drummond’s distinguishing characteristics of healthcare evaluations criteria,20 it is apparent that no full economic evaluation was conducted in any of the included studies. All studies performed partial economic evaluations of varying extents. The classification of economic evaluations resulted in 59 cost description studies (74% of those included), 15 cost–outcome descriptions and 5 cost analysis studies (online supplementary etable 2). The cost analysis of studies (figures 2 and 3) reported annual medication non-adherence costs incurred by the patient per year. The adjusted total cost of non-adherence across all disease groups ranged from $949 to $52 341, while the unadjusted total cost ranged from $669 to $162 699. Figures 2 and 3 highlight the minimum, maximum and interquartile range (IQR) of annual costs incurred by patients across disease groups where three or more studies were included for review. All-cause costs encompass non-adherence costs incurred in mixed disease state studies, taking into account other confounding factors such as comorbidities. Annual adjusted medication non-adherence costs per patient per year. Encompasses the minimum, maximum and IQR of adjusted annual costs incurred by patients across disease groups where three or more studies were included for review. Gastrointestinal only included three studies limiting the range of costs. All-cause costs encompass non-adherence costs incurred in mixed disease state studies, taking into account other confounding factors such as comorbidities. Annual unadjusted medication non-adherence costs per patient per year. Encompasses the minimum, maximum and IQR of unadjusted annual costs incurred by patients across disease groups where three or more studies were included for review. Epilepsy and addiction only included three studies limiting the range of costs. All-cause costs encompass non-adherence costs incurred in mixed disease state studies, taking into account other confounding factors such as comorbidities. Many different indicators were used to estimate medication non-adherence costs with no clear definition of what was incorporated in each cost component. The composition of included costs to estimate total cost or total healthcare cost varied significantly between studies, thus indicators were grouped for analysis based on the original studies’ classification of the cost. The main ones were total cost or total healthcare cost (83%), pharmacy costs (70%), outpatient costs (50%), inpatient costs (46%), medical costs (29%), emergency department costs (27%) and hospitalisation costs (18%) (online supplementary etable 2). Avoidable costs (eg, unnecessary hospitalisations, physician office visits and healthcare resource use) were not well defined with majority of studies failing to quantify these costs. Lower levels of adherence across all measures (eg, MPR, PDC) were generally associated with higher total costs. From those that reported total or total healthcare costs, 39 studies (49%) reported non-adherence costs to be greater than adherence costs24 25 27 29 31 32 34 37–39 41 42 46 48 49 54 55 57 60–64 69–77 83 85 86 95–98 and 11 studies (15%) reported non-adherence costs to be less than adherence costs.23 26 36 43 58 62 65 80 91 93 94 Four reported fluctuating findings based on varying non-adherence cost subcategories,33 47 66 92 and two studies reported conflicting findings between adjusted and unadjusted costs.78 79 Higher all-cause total non-adherence costs and lower disease group-specific non-adherence costs were reported in four studies,40 67 84 90 whereas Hansen et al 46 reported all-cause total non-adherence costs to be lower ($18 540 vs $52 302) but disease group-specific non-adherence total costs to be higher ($3879 vs $2954). The association between non-adherence and cost was determined through use of a variety of scaling systems. The most used methods were MPR and PDC. These measures could then further be subcategorised based on the percentage of adherence/non-adherence. The 80%–100% category was classified as the most adherent group across both scales, with the most common definition of non-adherence being <80% MPR or PDC. Cancer exhibited more than double the cost variation of all other disease groups ($114 101). Osteoporosis ($43 240 vs $42 734), diabetes mellitus ($7077 vs $6808) and mental health ($16 110 vs $23 408) cost variations were similar between adjusted and unadjusted costs while cardiovascular disease adjusted costs were more than double unadjusted costs ($16 124 vs $6943). Inpatient costs represented the greatest proportion of costs contributing to total costs and/or total healthcare costs for cardiovascular disease, diabetes mellitus, osteoporosis, mental health, epilepsy and Parkinson’s disease. HIV/AIDS, cancer and gastrointestinal disease groups’ highest proportion of costs were attributed to pharmacy costs while outpatient costs were greatest in musculoskeletal conditions. Direct costs had greater economic bearing than indirect costs across all disease groups. Cost comparisons across disease groups are summarised in online supplementary etable 3. Twelve studies measured the economic impact of medication non-adherence in cardiovascular disease.10 24 31 60 61 64 66 75 80 92 94 95 Six studies reported adjusted costs10 24 31 60 61 75 with annual costs being extrapolated for two of these.31 60 Total healthcare costs and/or total costs were assessed in all of the studies with the major indicators measured including pharmacy costs,10 31 60 61 75 medical costs10 24 31 60 75 and outpatient costs.31 61 The annual economic cost of non-adherence ranged from $3347 to $19 472. Sokol et al 10 evaluated the economic impact of medication non-adherence across three cardiovascular conditions: hypertension, hypercholesterolaemia and chronic heart failure. For all three cardiovascular conditions examined, pharmacy costs were higher for the 80%–100% adherent group than for the less adherent groups. Total costs and medical costs were lower for the adherent groups of hypertension and hypercholesterolaemia patients. However, for patients with chronic heart failure , total costs and medical costs were lower for the 1%–19% and 20%–39% adherent groups than for the 80%–100% adherent groups. The total unadjusted cost for medication non-adherence ranged from $2512 to $25 920 as reported in four studies.51 65 81 98 Becker et al 27 used a subgroup analysis to classify patients based on their adherence level. For every 25% decrement in the rate of adherence (75%–100%, 50%–74%, 25%–49%,<25%), non-adherence total costs increased. The negligible adherence group (<25%) incurred annual costs that were $3018 more than those of the maximal adherence group (75%–100%). Knapp et al 97 outlined the predicted cost of non-adherence with reference to relative impact and other factors associated with resource use and costs in patients with schizophrenia. Total costs ($116 434) were substantially higher than the other two indicators, which were inpatient costs ($13 577) and external services costs ($3241). Eleven studies reported a cost measurement of the impact of medication non-adherence with reference to the health system and the individual.13 44 46 50 73 75 82 83 91 93 96 One study estimated that the total US cost attributable to non-adherence in diabetes was slightly >$5 billion.50 Five studies reported the adjusted total healthcare costs and/or total costs with annual costs per patient ranging from $2741 to $9819.46 50 73 75 83 96 One study reported total costs in relation to subgroup analysis based on MPR level,73 and another reported total healthcare costs through subgroup analysis of commercially insured and Medicare supplemental patients.75 Curtis et al 83 used a diabetic population to report all-cause costs, with non-adherence costs being higher than adherence costs across all outcome indicators bar pharmacy costs. The cost of medication non-adherence in relation to osteoporosis was predominantly examined through analysis of the direct costs associated with non-adherence using total healthcare costs and/or total costs, inpatient costs, outpatient costs, pharmacy costs and emergency department costs. Two studies further assessed the economic impact of non-adherence through evaluation of fracture-related costs.47 87 Also, 4 out of 11 studies reported the adjusted cost of medication non-adherence in addition to reporting unadjusted costs.28 78 79 86 Three studies further classified non-adherence through subgroup analysis, with Briesacher et al 28 using MPR 20% interval increases and the two studies conducted by Zhao et al 78 79 using PDC, with ≥80% classified as high adherence, 50%–79% medium adherence and <50% low adherence. In the studies conducted by Zhao et al,78 79 total healthcare costs were highest for the medium adherence group ($41 402 and $44 190) followed by the highest adherence group ($37 553 and $43 863), and lowest for the low adherence group ($34 019 and $43 771). These annual costs were extrapolated from study data. In contrast, Briesacher et al 28 modelled the subgroup analyses against the lowest adherence group (<20% MPR), finding that costs decreased as adherence increased. The majority of studies reported unadjusted cost of medication non-adherence, with significant variation in the method of adherence classification.36 38 52 63 88 Two studies used MPR,36 63 one the Morisky four-item scale,52 one the Global Initiative for Chronic Obstructive Lung Disease 2007 guidelines88 and one a 37-day gap in claims data.38 Joshi et al 52 reported on the indirect costs of medication non-adherence through consideration of losses in total productivity costs, absenteeism costs and presenteeism costs, while all remaining studies examined direct costs. Delea et al 36 reported a direct relationship between decreases in medication non-adherence level and total costs, whereas Quittner et al 63 reported an inverse relationship between decreases in medication non-adherence level and total healthcare cost. The total expenses associated with the lowest subgroup of adherence across all measures ranged from $804 to $36 259. In contrast, Davis et al 84 used adjusted costs across four subclassifications of PDC adherence ranges to demonstrate that non-adherence costs were lower than adherence costs in all-costing outcomes reported except hospitalisation costs. Three of five studies reported the adjusted annual cost of medication non-adherence per patient using the MPR method.43 56 70 Of these, two reported the total cost ($12 085 and $37 151)43 70 with the main contributors to the overall total cost being inpatient costs (22% and 37%), outpatient costs (57% and 17%) and pharmacy costs (20% and 45%). The remaining two studies used infusion rates to assess non-adherence with neither reporting the total cost nor total healthcare costs.30 53 Carter et al 30 reported hospitalisation costs to be $42 854 while Kane et al 53 reported a significantly lower cost at $5566 in addition to other direct cost contributors. Three studies reported the economic impact of medication non-adherence in epilepsy. All reported unadjusted costs using an MPR cut-off of <80%.35 41 42 The main economic indicators used to assess total costs were inpatient costs ($2289–6874), emergency department visit costs ($331–669) and pharmacy costs ($442–1067). Davis et al 35 modelled the costs of the non-adherent group against the adherent group. The annual costs reported by Faught et al 42 were extrapolated from original cost data. The total cost of non-adherence in epilepsy ranged from $1866 to $22 673. The economic impact of medication non-adherence for patients with HIV and AIDS reported among all three studies was similar.26 32 62 Two of the three studies examined the costs only for HIV,26 32 while Pruitt et al 62 assessed the cost in AIDS as well as HIV. The total unadjusted costs for non-adherent HIV patients ranged from $16 957 to $30 068 with one study further categorising patients with HIV as having either a high viral load or low viral load.26 The total cost of non-adherence in AIDS was $30 523.62 All studies used comparable indicators (total cost, inpatient cost, outpatient cost, pharmacy cost) to determine the cost of non-adherence. Differing subgroup analyses was used to measure the impact of medication non-adherence on the annual cost incurred by patients. One study assessed both the direct and indirect costs of non-adherence,49 one assessed only the medical costs68 and one examined the direct costs in commercial and Medicare supplemental patient populations.77 Zhao et al 77 reported the adjusted annual cost in the commercial population to be $22 609, and in the Medicare supplemental group, $28 126. Ivanova et al 49 reported only unadjusted costs and the annual total cost of $3408. This figure was extrapolated from study data provided. The main indicators used to evaluate the economic impact of non-adherence were inpatient costs, outpatient costs, pharmacy costs and medical costs. Outpatient costs made the largest contribution to the overall total. Two studies evaluated the effects of medication non-adherence in cancer.33 74 One study reported total annual costs of $119 416,74 while the other gave a subgroup analysis based on classified adherence levels.33 In general, the lowest two adherence subgroups (<50% and 50%–90%) reported the highest total healthcare costs ($162 699 and $67 838). This trend followed for inpatient costs, outpatient costs and other costs, but the reverse relationship was found for pharmacy costs. The adjusted annual total healthcare cost of medication non-adherence was reported as $53 50455 while the unadjusted cost ranged from $16 996 to $52 213.55 69 85 Leider et al 55 reported the main contributors to this cost to be outpatient costs ($10 829) and pharmacy costs ($8855), whereas Tkacz et al 69 and Ruetsch et al 85 reported them to be inpatient costs ($28 407 and $5808) and outpatient costs ($15 460 and $5743). One study measured the influence of medication non-adherence on direct healthcare costs in metabolic conditions, reporting an unadjusted attributable total cost of $138 525.54 The economic indicators used to derive this cost were inpatient costs ($16 192), outpatient costs ($111 100), emergency department visit costs ($801) and pharmacy costs ($3538). Candrilli et al 29 reported cost findings on the relationship between non-adherence and healthcare costs, giving an adjusted total cost estimate of $13 458 for non-adherence classified as MPR <80%. 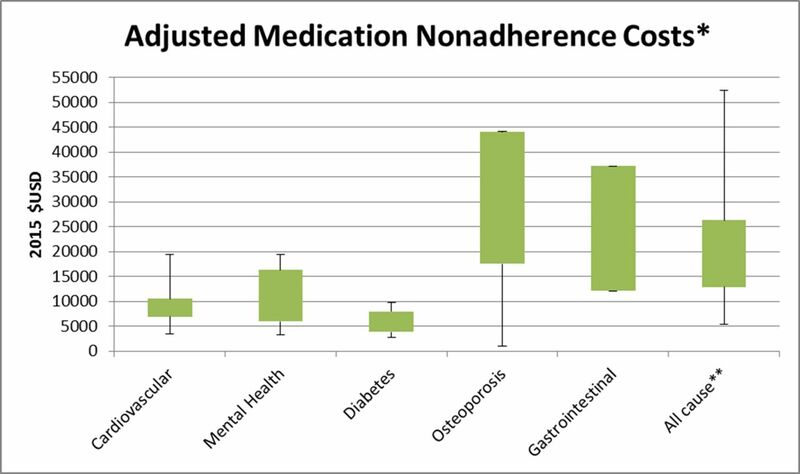 The adjusted cost of medication non-adherence was reported in 14 studies with an estimated range of $5271–52 341.10 29 31 56 58–60 70 75 76 83 84 86 90 Sokol et al 10 reported the all-cause cost of non-adherence through subgroup analysis of disease states and MPR levels, while Pittman et al 60 reported only using MPR-level breakdown. 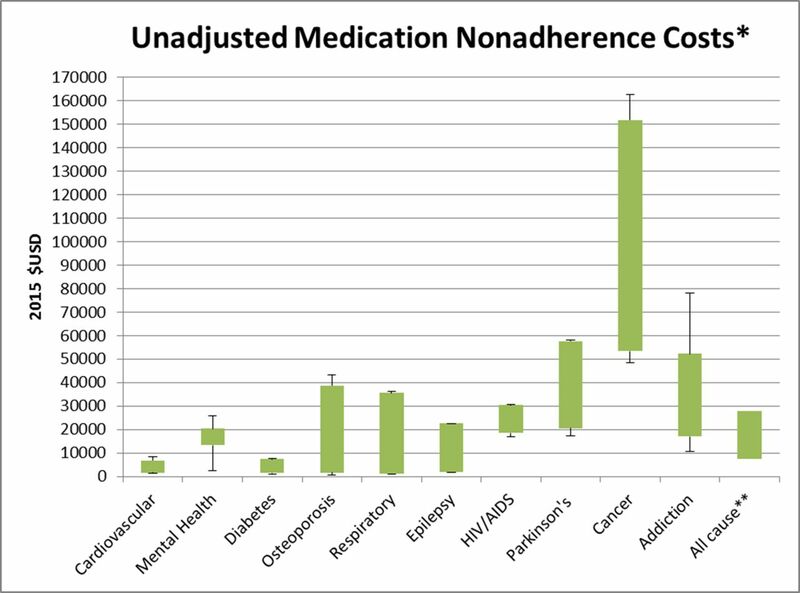 Fifteen studies reported the unadjusted economic impact of medication non-adherence with an estimated range of $1037–53 793.22 40 45 49 53 54 57 63–65 67 80 82 89 98 A further four studies reported adjusted and unadjusted costs.37 44 46 96 The most frequent indicators used to measure the economic impact were total healthcare costs and/or total costs (71%), pharmacy costs (75%), inpatient costs (46%), outpatient costs (46%), medical costs (28%) and emergency department visit costs (25%). Statistical analysis was attempted to collate the large collection of results from individual studies for the purpose of integrating the findings on the cost of medication non-adherence. However, the criterion for a meta-analysis could not be met due to the heterogeneity in study design and lack of required statistical parameters in particular SD.99 Combining studies that differ substantially in design and other factors would have yielded meaningless summary results. This systemic review broadens the scope of knowledge associated with the economic impact of medication non-adherence across different disease groups while building on previous reviews where greater focus was on targeting overall risk factors or conceptual issues associated with medication non-adherence. Medication non-adherence was generally associated with higher healthcare costs. A large variety of outcomes were used to measure the economic impact including total cost or total healthcare cost, pharmacy costs, inpatient costs, outpatient costs, emergency department costs, medical costs and hospitalisation costs. The costs reported reflect the annual economic impact to the health system per patient. None of the studies estimated broader economic implications such as avoidable costs arising from higher disease prevalence with studies failing to quantify avoidable costs separately to direct and indirect costs possibly due to coding restraints in healthcare claims databases. The majority of studies took the patient or healthcare provider perspective, estimating additional costs associated with non-adherence compared with adherence. Current literature identifies and quantifies key disease groups that contribute to the economic burden of non-adherence, but no research has attempted to synthesise costs across disease states within major healthcare systems. Comparisons across disease groups would benefit the development of health planning and policy yet prove problematic to interpret due to the varying scope of their inclusion (eg, mental health vs Parkinson’s disease). Similarly, there is substantial variation in the differential cost of adherence among disease groups with certain diseases requiring greater cost inputs (eg, cancer and supportive care costs). Further exploration of non-adherence behaviour and associated costs is required to adequately quantify the overall cost of non-adherence to healthcare systems as the available data are subject to considerable uncertainty. Given the complexity of medication non-adherence in terms of varying study designs, methods of estimation and adherence definitions, there is a limitation as to the ability to truly estimate costs attributed to non-adherence until further streamlined processes are defined. Significant differences existed in the range of costs reported within and among disease groups. No consistent approach to the estimation of costs or levels of adherence has been established. Many different cost indicators were used, with few studies defining exactly what that cost category incorporated, so it is not surprising that cost estimates spanned wide ranges. Prioritisation of healthcare interventions to address medication non-adherence is required to address the varying economic impact across disease groups. Determining the range of costs associated with medication non-adherence facilitates the extrapolation of annual national cost estimates attributable to medication non-adherence, thus enabling greater planning in terms of health policy to help counteract increasing avoidable costs. The economic, clinical and humanistic consequences of medication non-adherence will continue to grow as the burden of chronic diseases grows worldwide. Evolution of health systems must occur to adequately address the determinants of adherence through use of effective health interventions. Haynes et al 100 highlights that ‘increasing the effectiveness of adherence interventions may have a far greater impact on the health of the population than any improvement in specific medical treatments’. Improving medication adherence provides an opportunity for major cost savings to healthcare systems. Predictions of population health outcomes through use of treatment efficacy data need to be used in conjunction with adherence rates to inform planning and project evaluation.4 The correlation between increased non-adherence and higher disease prevalence should be used to inform policymakers to help circumvent avoidable costs to the healthcare system. The metric of adherence estimation varied substantially within and across disease groups; likely affecting the comparisons between studies. However, Hess et al,101 who compared six key adherence measures on the same study participants, found that the measures produced similar adherence values for all participants, although PDC and continuous measure of medication gaps produced slightly lower values. While this highlights the comparability of the measures of medication non-adherence, it further justifies the need to agree on consistent methods for estimating non-adherence through use of pharmacy claims data. MPR was the most commonly used measure to estimate medication non-adherence. MPR was used in 63% of studies, followed by PDC, which was used in 11%. These percentages were consistent with those found recently by Sattler et al.102 Even though the measures of medication non-adherence may be comparable, the definition of MPR and the cut-off points to define non-adherence differed significantly. Dragomir et al 94 defined MPR as the total days’ supply of medication dispensed in the period, divided by the follow-up period, with the assumption of 100% adherence during hospitalisation; Wu et al 75 removed the number of hospitalised days from the calculation; and Pittman et al 60 calculated the total number of days between the dates of the last filling of a prescription in the first six months in a given year and the first filling of a prescription in the 365 days before the last filling. Non-adherence could also be further classified into subcategories within MPR and PDC based on percentages. Thirty studies defined non-adherence as MPR <80%, and 12 studies categorised non-adherence into varying percentage subgroups. While Karve et al 103 validated the empirical basis for selecting 80% as a reasonable cut-off point based on predicting subsequent hospitalisations in patients across a broad array of chronic diseases, 76 of the 79 studies included in this review examined more than just hospitalisation costs as an indicator metric. Further research is required to identify and standardise non-adherence thresholds using other outcomes such as laboratory, productivity and pharmacy measures. Within the 79 studies covered, 35 different indicators were used to measure the cost of non-adherence and 19 reporting styles were identified. Because of the resultant heterogeneity, a meta-analysis was impossible. It is imperative that a standardised approach be established to measure and report the economic impact of medication non-adherence. The core outcome set must take into consideration the perspective of the intended audience and the proportion of non-adherence cost that is attributable to each outcome to determine an appropriate model.104 The critical indicators based on the findings of this review include total costs, pharmacy costs, inpatient costs, outpatient costs, emergency department visit costs, medical costs and hospitalisation costs for analysis based on direct costs. For indirect analysis, the core outcomes include short-term disability costs, workers’ compensation costs, paid time off costs, absenteeism costs and productivity costs. We suggest that further analysis of the contribution of each outcome to the overall cost of non-adherence be undertaken to help develop a tool that can be used for future research. Many studies have examined the relationship between non-adherence and economic outcomes using a cross-sectional analysis.50 The implications of this are that potentially crucial confounders such as baseline status are ignored. In addition, a cross-sectional analysis may obscure temporality: for example, did greater adherence result in reduced costs and improved health outcomes, or was the patient healthier initially and more capable of being adherent? A longitudinal design is needed to overcome this limitation. Economic evaluations inform decisions on how to best make use of scarce societal health resources through offering an organised consideration of the range of possible alternative courses of action and the evidence of the likely effects of each.20 While none of the studies taken separately could inform a choice between alternative courses of action, they did provide key evidence for decision makers about costs associated with medication non-adherence. Pharmacy claims data were used by the majority of studies to model cost estimates. Three-quarters of the studies were classified as cost descriptions, providing a cost or outcome overview of the health consequences associated with non-adherence. Ten studies garnered a high-quality classification, potentially limiting the overall conclusions that are able to be drawn and emphasised the need for future study design to incorporate elements allowing full economic evaluations to be conducted. Hughes et al 105 highlighted the need for more information on the consequences of non-adherence, so that economic evaluations could reflect the potential long-term effect of this growing problem. Of the 79 included studies, 66 of the studies were conducted in the USA. Conversion of costs to a common currency (US$) facilitated the comparison of studies and disease groups. Comparison of costs between healthcare systems is difficult as no two are the same and as healthcare is generally more expensive in the USA, cost estimates may not reflect average values. Thus caution needs to be taken when interpreting results; however, findings help to represent the significance of the economic burden medication non-adherence plays. Analysis of studies not conducted in the USA supports the finding that generally medication non-adherence incurs greater costs for all cost indicator outcomes other than pharmacy costs. Due to the advances in technology available to record and assess medication non-adherence, the inclusion of studies undertaken in the late 1990s and early 2000s may have affected the comparability of results, despite the fact that these studies met the inclusion criteria.22 23 64 72 73 97 The quality of data presents a limitation. Information on disease groups with fewer included studies may be less reliable than information on those with more. However, our findings affirm the pattern of association between non-adherence and increasing healthcare costs. Medication non-adherence places a significant cost burden on healthcare systems. However, differences in methodological strategies make the comparison among studies challenging and reduce the ability for the true economic magnitude of the problem to be expressed in a meaningful manner. Further research is required to develop a streamlined approach to classify patient adherence. An economic model that adequately depicts the current landscape of the non-adherence problem using key economic indicators could help to stratify costs and inform key policy and decision makers. Use of existing data could help to better define costs and provide valuable input into the development of an economic framework to standardise the economic impact of medication non-adherence. RC research is supported by an Australian Government Research Training Program Scholarship. Centres for Disease Control and Prevention. Chronic disease prevention and health promotion. http://www.cdc.gov/chronicdisease/overview (accessed 24 Jun 2016). World Health Organisation, National Institute of Aging, National Institute of Health and US Department of Health and Human Services. Global health and ageing. 2011 http://www.who.int/ageing/publications/global_health.pdf (accessed 24 Jun 2016). Congressional Budget Office. Offsetting effects of prescription drug use on medicare’s spending for medical services. Congressional budget office report. 2012 http://www.cbo.gov/sites/default/files/cbofiles/attachments/43741-MedicalOffsets-11-29-12.pdf (accessed 10 Aug 2017). World Health Organisation. Adherence to long term therapies; evidence for action. 2003 http://www.who.int/chp/knowledge/publications/adherence_full_report.pdf?ua=1 (accessed 6 Nov 2015).
. COncordance, adherence and compliance inmedicine taking. Report for the national coordinating centre for nhs service delivery and organization R & D (NCCSDO), 2005. New England Healthcare Institute. Thinking outside the pillbox: a system-wide approach to improving patient medication adherence for chronic disease. 2009 http://www.nehi.net/publications/44/thinking_outside_the_pillbox_a_systemwide_approach_to_improving_patient_medication_adherence_for_chronic_disease (accessed 24 Jun 2016). Pharmaceutical Group of the European Union. Targeting adherence. Improving patient outcomes in Europe through community pharmacists’ intervention. 2008 http://www.pgeu.eu/policy/5-adherence.html (accessed 28 Jan 2016). IMS Institute for Healthcare Informatics. Advancing the responsible use of medicines; applying levers for change. 2012 http://pharmanalyses.fr/wp-content/uploads/2012/10/Advancing-Responsible-Use-of-Meds-Report-01-10-12.pdf (accessed 10 Mar 2016). AIHW. Health and welfare expenditure series no.57. Cat. no. HWE 67. Canberra: AIHW, 2016. American Pharmacists Association/APhA AP. Medication compliance-adherence-persistence (CAP) Digest. Washington DC: American Pharmacists Association and Pfizer Pharmaceuticals, 2003. OECD. Health at a Glance: OECD Publishing, 2015.
, Cochrane handbook for systematic reviews of interventions version 5.1.0: The Cochrane Collaboration, 2011.
. Methods for the economic evaluation of health care programmes. Oxford: Oxford university press, 2015.
. Is there a relationship between early statin compliance and a reduction in healthcare utilization? Am J Manag Care 2010;16:459–66.
. Treatment interruptions and non-adherence with imatinib and associated healthcare costs: a retrospective analysis among managed care patients with chronic myelogenous leukaemia. Pharmacoeconomics 2007;25:481–96.
. Healthcare costs and nonadherence among chronic opioid users. Am J Manag Care 2011;17:32–40.
. Antihypertensive medication adherence and subsequent healthcare utilization and costs. Am J Manag Care 2010;16:568–76.
. Medication adherence and improved outcomes among patients with type 2 diabetes. Am J Manag Care 2017;23:e208–e14.
. Impact of Nonadherence to inhaled corticosteroid/LABA therapy on COPD exacerbation rates and healthcare costs in a commercially insured US population. Am Health Drug Benefits 2017;10:92–102.
. Heterogeneity of nonadherent buprenorphine patients: subgroup characteristics and outcomes. Am J Manag Care 2017;23:e172–e79. Contributors RLC and VGC performed all the data extraction and quality assessment. RLC drafted the initial form and all revisions of this manuscript. All authors conceived the paper, made significant contributions to the manuscript and read and modified the drafts, and read and approved the final manuscript. Competing interests RLC’s research is supported by an Australian Government Research Training Program Scholarship. Data sharing statement All data from systematic review available in paper and supplementary material.